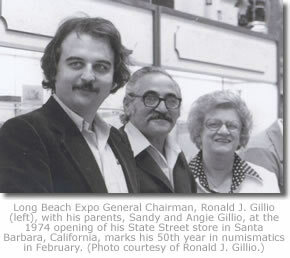 (Long Beach, California) – The next Long Beach Coin, Stamp & Collectibles Expo, February 5 – 7, 2009, marks the 50th anniversary in numismatics for internationally-known Expo General Chairman, Ronald J. Gillio. The three-day show will be held at the Long Beach, California Convention Center, 100 S. Pine Ave.
"It was early 1959 when I saw my first Lincoln Memorial cent, the first year they were made, and I was curious about it. Ever since then numismatics has been a vital and enjoyable part of my life," said Gillio. "My first collections – like everyone else – were mostly pennies and nickels. Living in Southern California when I’d go to my neighborhood banks in Southern California to get rolls of coins, I’d frequently find San Francisco mintmarks; coins that were scarce in other parts of the country." Gillio said his Mother and Father, Sandy and Angie Gillio, were very supportive of his hobby, and were with him to celebrate the opening day of his first store on State Street in Santa Barbara, California in 1974. 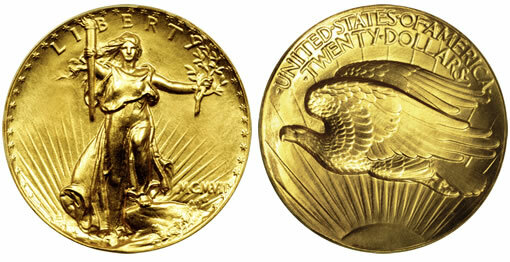 (Santa Clara, California) – The finest known 1907 Ultra High Relief Saint-Gaudens Double Eagle gold coin will be the centerpiece of a multi-million dollar exhibit, "100 Greatest U.S. Coins," during the first three days of the Santa Clara, California Coin, Stamp & Collectibles Expo, November 13 – 16, 2008. The show will be held in the Santa Clara Convention Center, 5001 Great America Parkway, where free parking is available. "The Ultra High Relief is graded PCGS Proof-69 and will be the focal point of an exhibit based on the popular book, ‘100 Greatest U.S. Coins.’ This outstanding display is courtesy of Certified Assets Management of Wilmington, Delaware, which values the Ultra High Relief at $5 million," said Ronald J. Gillio, Expo General Chairman. "This famous coin was designed by renowned sculptor, Augustus Saint-Gaudens, at the personal request of President Theodore Roosevelt. It was struck seven times to bring up all the beautiful features in the design. There are less than 20 known surviving examples, and this is the finest," said Don Ketterling, Executive Vice President of Certified Assets Management. "This magnificent piece could establish itself as ‘the Holy Grail’ of American numismatics."